Welsh Dragon fully lined drawstring bag. Dimensions: approx 38 cm x 41 cm (W x H). Front panel: 100% cotton | Back panel: mixed fibre material | Lining: 100% cotton poplin. This Welsh Dragon drawstring bag is fully lined and made with high-quality materials. It measures approximately 15″ wide x 16.25″ long. 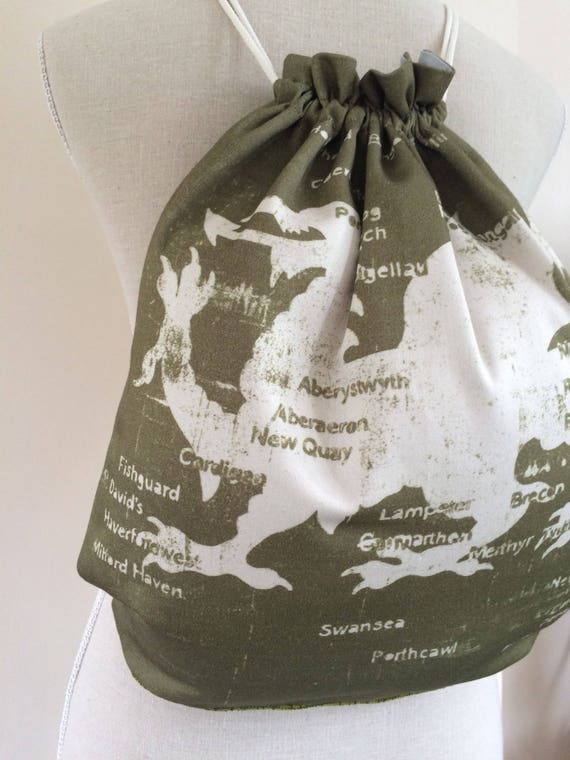 The outer material of the front panel is 100% cotton with a white Welsh Dragon and Welsh place names on a green background. The back side panel is a green textured mixed fibre material. The stitching is in brown to reflect the colouring of the front and back panels. The lining material is light grey 100% cotton poplin. The draw-string cord allows the bag to be worn over one or both shoulders (like a rucksack). Machine wash at a low temperature. Do not tumble dry. Can be ironed at a medium temperature.